Hello, human! My instruments indicate that we’ll see an update to ThinkSpace this coming Monday (9/12/2016). I’m detecting some changes in the way we will navigate around the system, some old features refurbished, a smarter case builder, some new templates, and a slew of pesky bugs squashed. To prepare for the update, I am scheduled to take the system down at 10:00 PM CT on the 11th. The expected downtime is 3 hours. We’ve moved the left navigation bar to the top of the screen. This saves quite a bit of screen real estate and stages us for more support for tablets and mobile devices. The left navigation bar was introducing a lot of confusion and wasn’t particularly good at telling the user where they were in ThinkSpace. We’ve also replaced the more ambiguous buttons in the old navigation bar with some breadcrumbs that let you know exactly what space, case, and phase you’re currently in. You can also use them as navigation to take you exactly where you want to go at anytime. Case wide scores have returned for instructors and teaching assistants! Each case now features a ‘Scores’ tab where you can get a list of all the students in the space, their related scores and states for each phase at a glance. The interface will allow you to drill down to an individual phase or view the case in aggregate. There are some issues when accessing this for larger class sizes. It will take awhile to load, and in some cases, may not load at all. We’re working on making this more performant, so hang in there with us in the mean time. The initial launch will include the phase templates, but we’ll be releasing a new set of core case templates over the next few days. From there, expect to see additional case templates added over time. Building cases is an essential part of ThinkSpace. We know that you want to get it right the first time, so we’ve augmented the case builder to give you more feedback when things don’t look quite right. For example, if you’ve added a team-based phase but haven’t given it a team set, a notification will be displayed letting you know that you’re still missing a team set. We’re hoping details like this will help improve the case building experience. The current implementation only provides notifications on a few common issues. This lays the groundwork for us to add many more in the future when we see that people are having issues with certain pieces of case building. Fixed rounding to two decimal points for the overview phase. Added numeric start and end values to all scales. 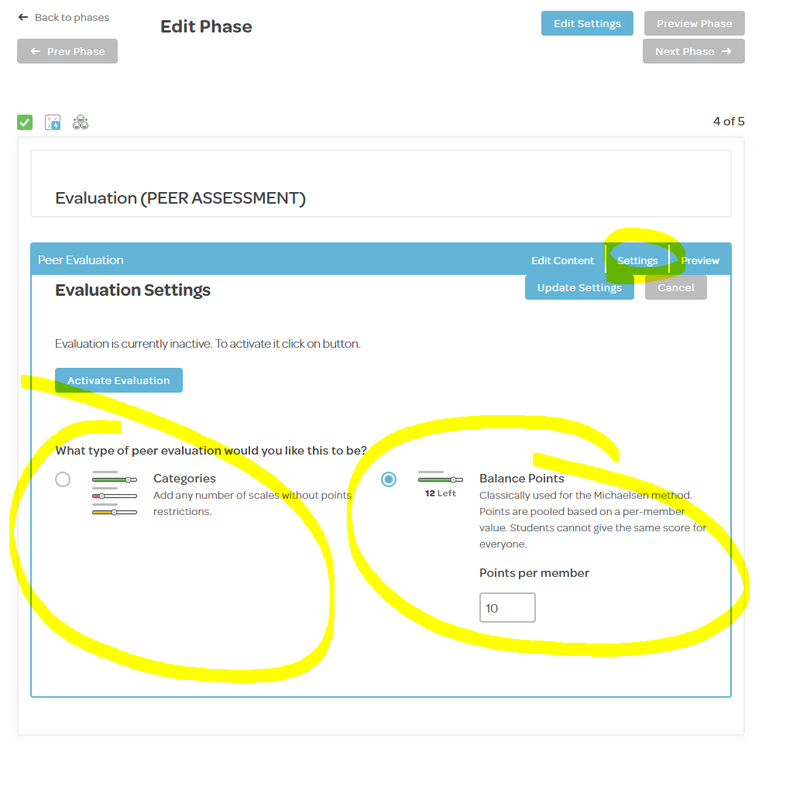 The browser’s forward and back buttons now work correctly when navigating through students in the peer evaluation. Added the ability to explicitly set whether the evaluation is a ‘categories’ type or balance points. Each type has their own confirmation screens and UI elements when taking an evaluation. Numerous UI updates and enhancements. Builder preview is now more up-to-date with the actual phase version. The builder no longer fails on saving input elements for certain use cases.